Have you been searching for that perfect, versatile, all-rounder tractor? Well, look no further than Massey Ferguson’s 5600 Series. 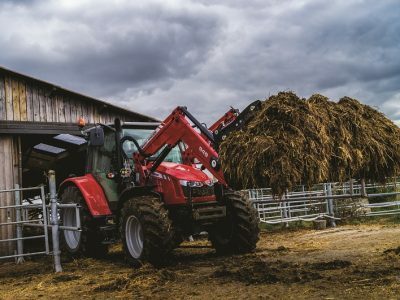 The MF5610 is one of Massey’s most popular loader tractors, specifically designed to provide ultimate handling with the MF900 series loaders in mind. The 105hp tractor features Dyna 4 transmission and the all-powerful, 3-cylinder AGCO Power common rail engine. The engine provides optimum fuel efficiency and reliability you can depend on to get your jobs done right every time. The AGCO POWER have gained a strong reputation as being one of the world’s leading manufacturer of agricultural engines. 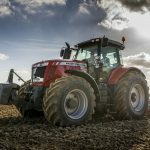 With a strong focus on research and development, they are constantly updating and refining the AGCO engines to give their customers the best engine in their tractor. 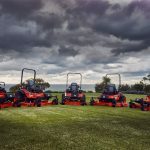 The 5600 series range includes a three-cylinder engine that is maintenance free, gives you exceptional power and efficiency, yet is compact for high visibility over slim steep nose bonnet. The Dyna 4 transmission has been specifically optimised for use in the 5600 series. This gives you robust reliability with the smooth effortless operation and clutchless control via the left-hand Power Control. Also included as standard on this series is the brake-to-neutral function, which means that as soon as the brake is pressed it operates the clutch at the same time. AutoDrive will help you get the job done accurately by giving you automatic drive in two modes; tortoise and hare. The MF5610 cab access is designed for the ultimate ease of entry and exit with a wide opening left and right-hand doors. The cab also features a fully adjustable bottom step which allows the user to choose the height they need to step into the tractor. It also combines; space, comfort, clear visibility and a slimline dashboard to ensure the highest levels of comfort while you work. 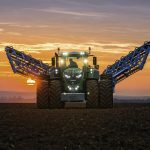 The close coupled front linkage designs make the tractor compact, which helps stability and manoeuvrability, especially when working on hillsides. 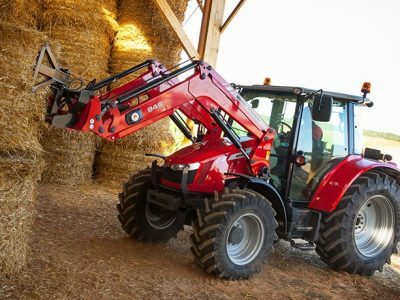 The front linkage has a 2,500kg lift capacity which allows the tractor to lift a range of implements. 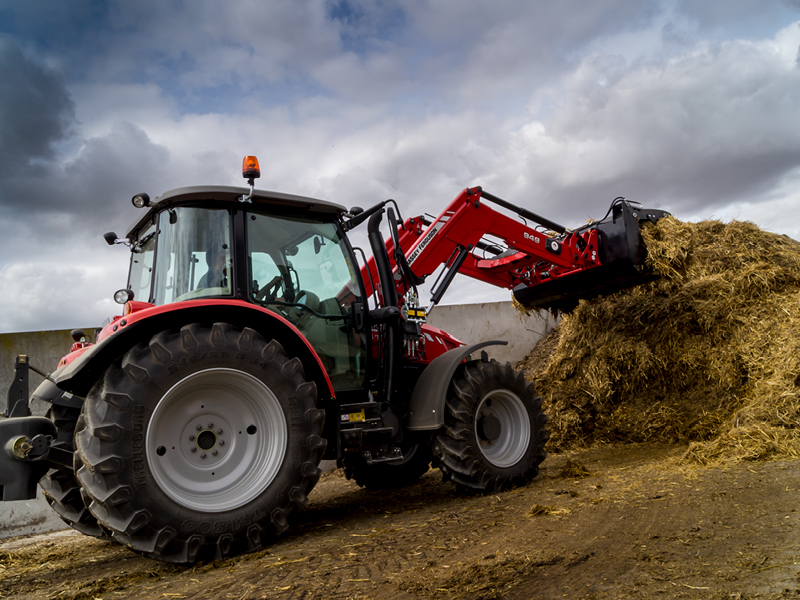 The rear linkage has been made to complement the size of the MF5610 and has an impressive lift capacity of 4,300kgs allowing heavy-mounted equipment to be lifted with ease. 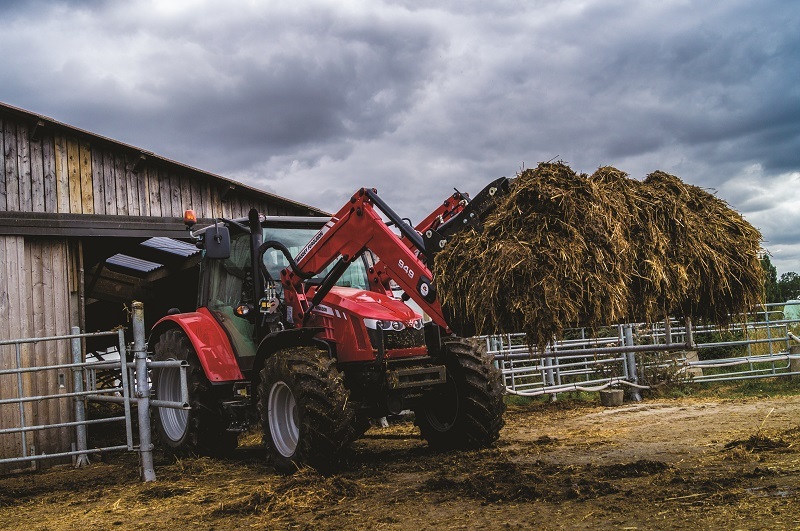 The loader for the MF5610 will make you happy during your early morning operations. It has a fully integrated loader sub-frame, mechanical joystick, excellent visibility, agile design, enclosed pipework to reduce the risk of damage and fast coupling of all hoses. 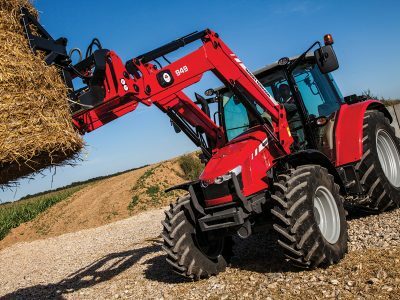 The loader for the MF5610 has a lift capacity of up to 4m with a lift capacity at max height of 2,060 kg. Scott Van Norden, our sales person from our Smithton branch says that “our Massey Ferguson customers are impressed by the wide vision and sloping cab in the MF5610 and the sharp turning ability that is enabled by the powerful 3-cylinder engine.” Scott believed that “the Massey Ferguson brand is a big win in the Circular Head area due to its reliability and ability to handle tough conditions”. 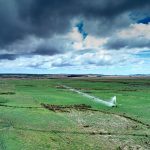 With all these top of the range features, it is easy to see why the Massey Ferguson 5600 Series is Tasmania’s most popular Massey.